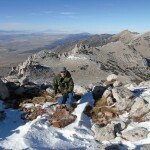 Rock Canyon Peak in the Onaqui Mountains offers a 360-degree view of mountains and desert. Tooele County’s west desert is so full of interesting places, it’s impossible to see them all in one lifetime. Whatever the origin of the name, this little group of mountains between Johnson’s Pass to the north and Lookout Pass to the south is easily accessible and worth a visit. The main access points to the range are at the two passes. At Johnson’s Pass, there is a paved parking area with interpretive panels that could be used as a starting point for heading south into the Onaquis. Similarly, there is a gravel turnout at the summit of Lookout Pass where you can park and then head north. Both of those passes are usually accessible all year depending on the weather. This week’s article is about a little-known, pyramid-shaped peak in the southern part of the Onaqui Mountains named Rock Canyon Peak. If you look to the right as you approach the mountains from Rush Valley traveling west along the Pony Express Trail, you will see an unassuming, tan mountain that has had a majority of the juniper trees burned off it. The high point of this little group of mountains is Rock Canyon Peak. While it’s less than impressive from the east, the view of the mountain from the west is a different story. 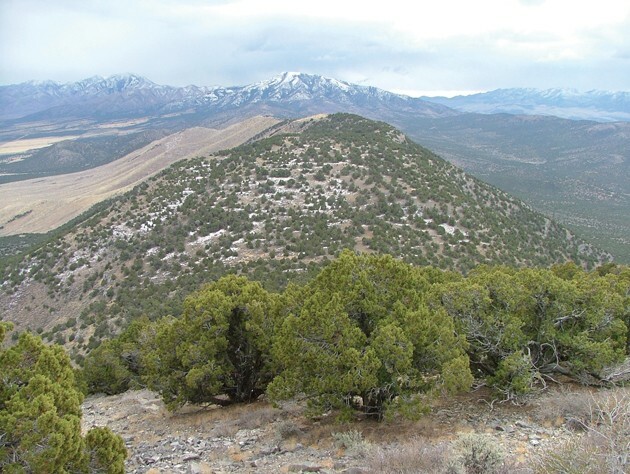 If you are out in the southern end of Skull Valley traveling east along the Pony Express Trail from Simpson Springs, this same group of mountains is heavily cloaked in a thick forest of dark green Utah junipers. 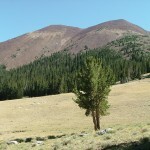 The average height along the summit ridge is 7,000 feet, culminating in the pyramid-shaped summit of Rock Canyon Peak at 7,474 feet in elevation on the north end of the ridge. This peak rises abruptly from the plain and ash-gray bands of limestone that peer out upon the desert from the juniper forest. While not terribly tall, Rock Canyon Peak provides an opportunity to engage in some good desert hiking where it is likely you will be undisturbed by anyone else. The views from the high bench and foothills of the range, and from the summit ridges, provide fantastic views of the Great Salt Lake Desert, especially at sunset. To get to the recommended starting point, follow SR-36 south out of Tooele for nearly 30 miles and before reaching the town of Vernon, turn right onto the Pony Express Trail. Follow this well-maintained dirt road over Lookout Pass. 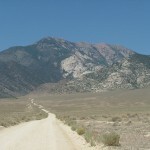 At the western foot of the pass, as the road bends north around a small shoulder of mountain into Skull Valley, a road breaks off to the north along the base of the mountains. This is the Terra/Davis Knolls road. Turn right onto this road and follow it for approximately two-tenths of a mile to where you will notice another, more primitive road break off to the northeast up a draw into the junipers. This is the Dry Creek road. If you don’t have a 4X4 vehicle, this will be your starting point. Find a reasonable place to park your vehicle where you won’t get stuck in sand or be swept away by a flash flood and then follow the primitive road on foot east toward the mountains through the junipers. The approach toward the mountains along this road makes for an enjoyable walk with views of the forested peaks. It is likely you will see jackrabbits, mule deer, pronghorn antelope or even some wild horses as you explore this area. After 2.1 miles from the start point, you will arrive at a road junction. Bear right toward the mountain and you will climb up to Rock Canyon Pass via a series of well-defined switchbacks. The roads in this area have suffered severe erosion damage. Apparently, few large vehicles make it to this area anymore because the roads have been narrowed, primarily by ATV use. However, these old roads make for excellent footpaths, as they are still plainly recognizable and easy to follow. As you climb up to the pass, the view west into the desert gets more incredible with every foot of elevation gain. Take a moment to look around on the ground as you walk. I noticed dozens of tiny white snail shells or cephalopods, which seem to be out of place in this desert environment. Many of the gray limestone rocks are covered with circular splotches of bright orange lichens. In the shaded places there are fuzzy green lumps of moss on some of the rocks. These rocks, set in the dark green of the junipers with a blue sky overhead, make for a colorful scene. Once you reach the pass at an elevation of 6,837 feet, you will be greeted with a view of Rush Valley and the far-off, snowcapped Wasatch Mountains. The pass is a great destination because there are interesting rocks you can sit on, take a break and enjoy a sack lunch. From the pass, you can head north into the seldom-visited central portion of the Onaqui range, which is half burned and half intact, making the mountains appear as though they are covered with a quilt. If you venture north along the spine of the mountains, you will encounter several interesting bands of limestone cliffs that can be fun to climb on and explore. 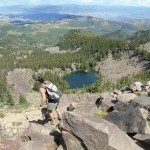 For Rock Canyon Peak, head south from the pass and find your way up to the highpoint. This is where the character of the hike changes. The distance from the pass to the summit is only .4 miles, but you will gain over 600 feet in elevation along this short distance. Once you conquer the steepest portion of the mountain, the summit area levels off into an elevated plateau, which is surprising given its conical appearance from the west. The last stretch of hiking to the high point through the grass, junipers and sage is enjoyable. The 360-degree view of mountains and desert are astounding. The summit of the peak is capped with a limestone cliff belt that is 10-20 feet high. The gradual ascent falls off abruptly to the west from the edge of this limestone cap. Sitting on top of the limestone belt and looking west over the Pony Express Country — range after range of bleak, desert mountains with the 12,000-foot-high peaks of the Deep Creek Range in the distance — is an experience difficult to capture in words. You really get a sense of being on the edge of it all. Gazing across the desert from that vantage point reminds me we are given a finite amount of time to enjoy life — so make the most of it. Get off the beaten track and experience things that give life a spark that can’t be achieved except through nature. If you decide to venture into this area, make sure you are prepared. Take plenty of water since the Onaquis are a dry, desert range. If rain is in the forecast, don’t venture onto the Terra-Davis Knolls road. Trust me, you will be sorry and more than likely get stuck. One-way distance from the car park to the summit is 3.8 miles, so this is a long desert hike. For more information on this area, contact the Bureau of Land Management – Salt Lake Field office at 801-977-4300.